If you ask award-winning journalist Collier Meyerson why she chose to live in the historic Coop Village, in Manhattan's Lower East Side, she says, "I didn't want to live here. It's Evan's place." 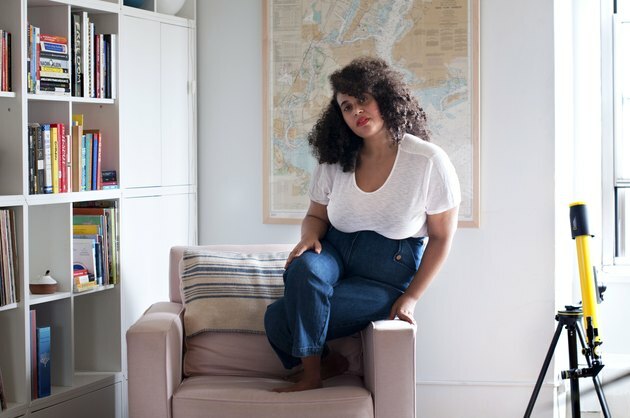 And while it's true that her partner, New York City public defender Evan Rock, had lived in this 850-square-foot apartment for 16 years, it's not to say Meyerson hasn't made her own mark. It just took some time — and some honeymoon funds. "I called it 'brown town' because literally everything in the apartment was brown," Meyerson said about the place before she moved in. But there were views of the Williamsburg Bridge, the East River, and the FDR from their window; and Moishe's Bakery down the street. 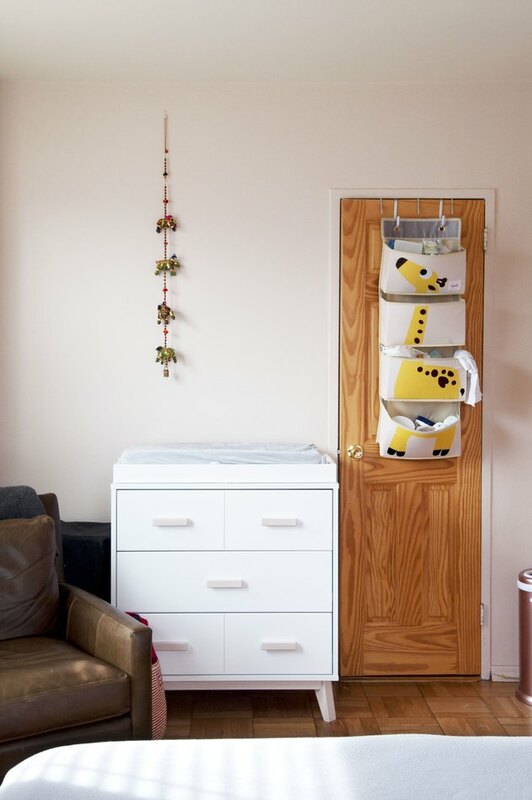 In the year since Meyerson moved in, there's a lot less brown — as well as a tiny DIY nursery carved out of the living room for their son, Oz. Now, the vibe is more "Lower East Side on the outside, Serene California Sedatives on the inside." The California vibe is not homegrown — both Meyerson and her partner are New York City natives, she from Manhattan and he from Queens. 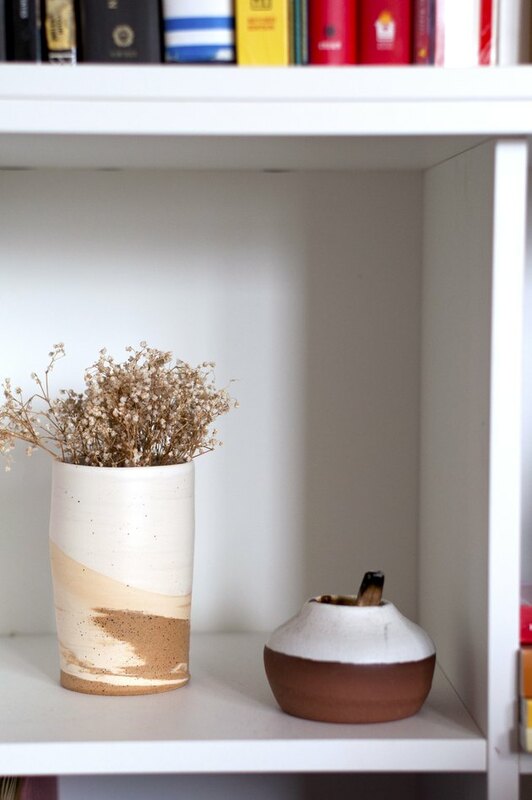 But you can see California style in the classic pairing of white walls and wood, the warm textiles and ceramics and, of course, the surfboard hanging in the hallway. 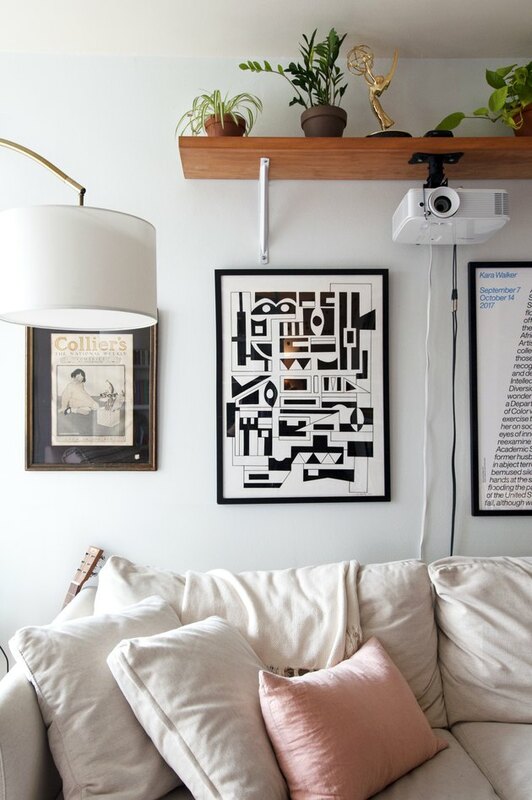 As with any Manhattan apartment, the trick is to create the illusion of space — and here, no square inch is wasted. 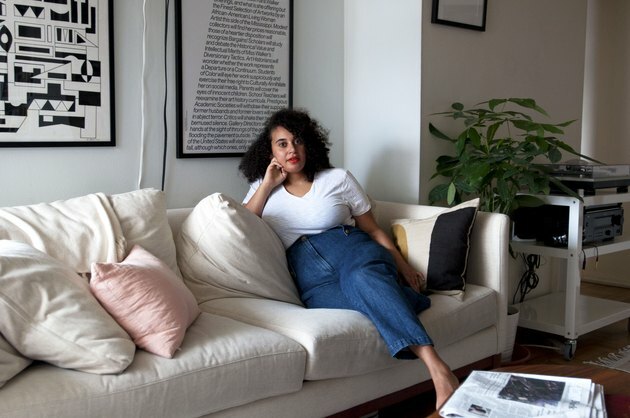 "New York City apartments can feel real cramped real fast and it was incredibly important that I create a space that didn't feel as small as it is," says Meyerson. "I think that shines through." 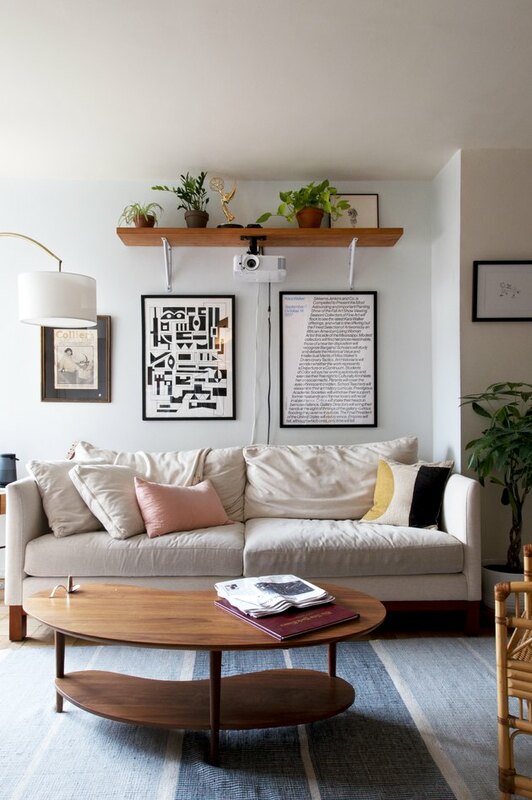 "I love the living room because it's the only room in the house I truly could transform without doing any structural work to," says Meyerson. 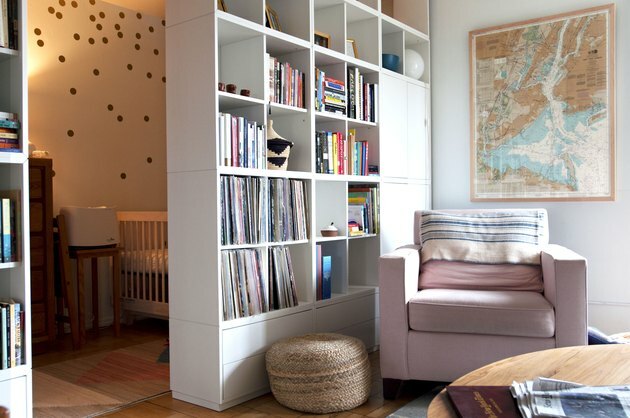 Meyerson and Rock built the bookshelf that serves as a wall and separates their son's nursery from the living room. The bedroom, says Meyerson, is still a work in progress. "The more pregnant I became, the less energy I had," she says. 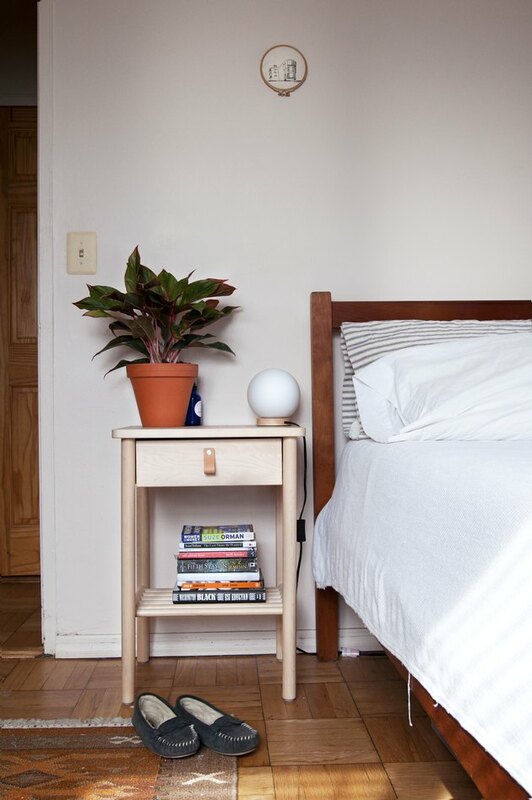 "I still haven't gotten around to making the bedroom something I feel particularly proud of." 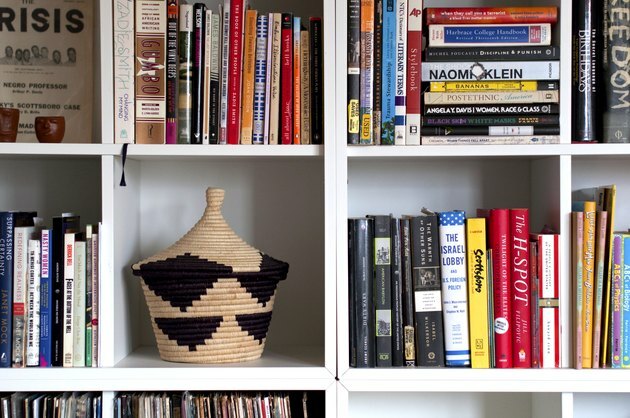 And it's the small details that make the space feel personal, without feeling cluttered. One of Meyerson's prized possessions: an old, framed Collier's Magazine cover she got in the Catskills when she was 10 years old. It hangs alongside a Kara Walker poster Meyerson took from a gallery, as well as Zion photo and a framed Catskills poster. (Both Rock and Meyerson had houses in the Catskills growing up.) And, of course, the Emmy that Meyerson earned for her work on MSNBC's All In with Chris Hayes. The shelving, above, was repurposed from the time before Meyerson moved in. 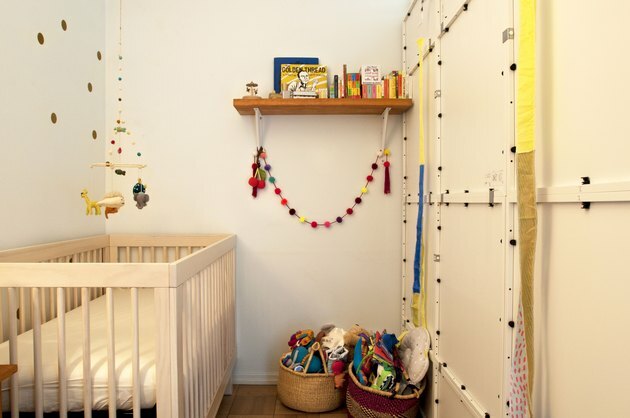 "Originally the shelves that line the length of our apartment were set up as floor-to-ceiling shelves with a flat-screen TV in the middle on the wall that is now our baby's room," she says. "It was a real bachelor look." "For our wedding, instead of spending hours on one website picking out crystal we'd never use, I decided we'd ask guests for money. So, we did. In fact, I believe the Honeyfund read, 'Make our apartment Instagrammable.'" And it did. The result? A space that is, in Meyerson's words, "lived-in, calm, and reflective of our family's interests." Favorite piece of design or architecture in your neighborhood, town, or city: There's this old amphitheater a couple of blocks away in the park. Frankly, it's kind of ugly. It looks like a retro alien landed on the East River 70 years ago and refused to leave. Before moving to this neighborhood I'd never seen it, but every time I pass it now, I always see neighborhood kids skateboarding on its benches, or old guys sitting next to one another having a laugh. In the summertime when I was super pregnant there was a concert series and we went a couple of times. It was incredible. The acts really represented the neighborhood. The first was some sort of Latinx cover band and there were all of these people doing merengue in the front. The second time we went was some band that is a real hit with the teens. And there was a guy running up and down the center aisle selling these insanely alcoholic drinks close to my heart called Nutcrackers out of a big cooler. NYPD was standing up against the side aisle turning a blind eye, watching the teenybopper band play their jams. Best places for thrift store finds, antiques, or flea markets: Don't thrift or antique in New York, it's too expensive! But if you have to, there's a place called Dobbin St. Vintage Co-Op for furniture. Cross the river and head to Udelco in Jersey for the giant bins of amazing '70s clothes. Best happy hour: I like to go to Metrograph because no one is there and the drinks are great! Best cheap and cheerful restaurant: I don't know about cheap, but LES Enfants de Bohème always has a free table and their staff is so warm. And they've got a creperie, too! Best place to experience art and culture: New Museum! Best coffee shop: In my neighborhood? There's literally only one… Ost. If I were to have visitors, I would take them to: Dimes. And I'd force them to get the cod and a wheatgrass margarita. 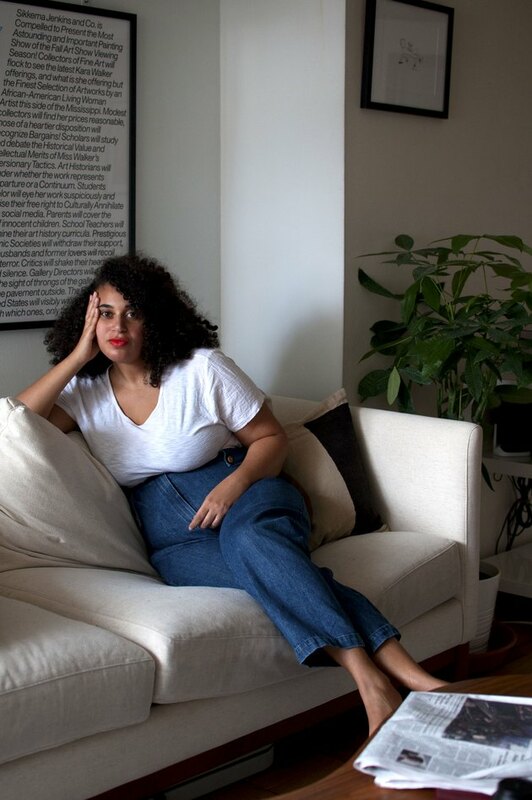 Laura Lambert is a Los Angeles-based writer and editor who covers lifestyle, design, and women's health.